Concerns over an unstable energy supply and the adverse environmental impact of carbonaceous fuels have triggered considerable efforts worldwide to find carbon-free or low-carbon alternatives to conventional fossil fuels. Carbon-Neutral Fuels and Energy Carriers emphasizes the vital role of carbon-neutral energy sources, transportation fuels, and associated technologies for establishing a sustainable energy future. Each chapter draws on the insight of world-renowned experts in such diverse fields as photochemistry and electrochemistry, solar and nuclear energy, biofuels and synthetic fuels, carbon sequestration, and alternative fuel vehicles. After an introductory chapter on different energy options in a carbon-constrained world and proposed measures to stabilize atmospheric CO2, the book analyzes the advantages and challenges facing the introduction of hydrogen fuel to the marketplace. It then examines the role of nuclear power in the production of carbon-free energy and fuels as well as the efficient use and storage of renewable energy resources, emphasizing the production of solar fuels from water and CO2. The book also discusses different aspects of bioenergy and biofuels production and use and the potential role of bio-inspired energy systems and industrial processes. The final chapters present a thorough overview and analysis of state-of-the-art fossil fuel decarbonization technologies and clean transportation options. This authoritative work provides the information needed to make more informed choices regarding available clean energy and fuel alternatives. It helps readers to better understand the interconnection between energy and the environment as well as the potential impact of human activities on climate. The treatment is very comprehensive, ranging from hydrogen to biofuels, and from decarbonized fossil fuels to fuels produced by recycling atmospheric carbon dioxide. The detailed discussion of different energy options is preceded by a comprehensive overview of the problem of negative environmental impact of anthropogenic carbon dioxide emissions. In such an overview, the different technologies are introduced without bias towards one or the other solution so that for every specific situation you can find a very balanced transition scenario. The approach and topics chosen are excellent. 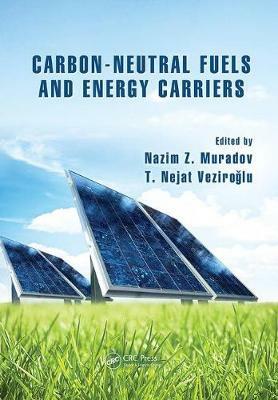 ... very thorough coverage of the field ... Each of the carbon-neutral fuels and energy subjects discussed in the chapters is written by an expert in the field. Thus, not only is the entire field comprehensively covered by the book but each of the fuels and energy subjects is presented in depth. This makes the volume that much more valuable, not only for teaching purposes but also for use by research and policy workers.